In order to raise funds for the completion of MONDO BANANA’s production, we’ve launched a fundraising campaign on Kickstarter. Banana-leaf Nagas with carved pumpkin eyes. Nagas are serpent gods in Hindu & Buddhist mythology. In other news… During the month of June, the MONDO BANANA team explored banana-leaf art in Thailand! 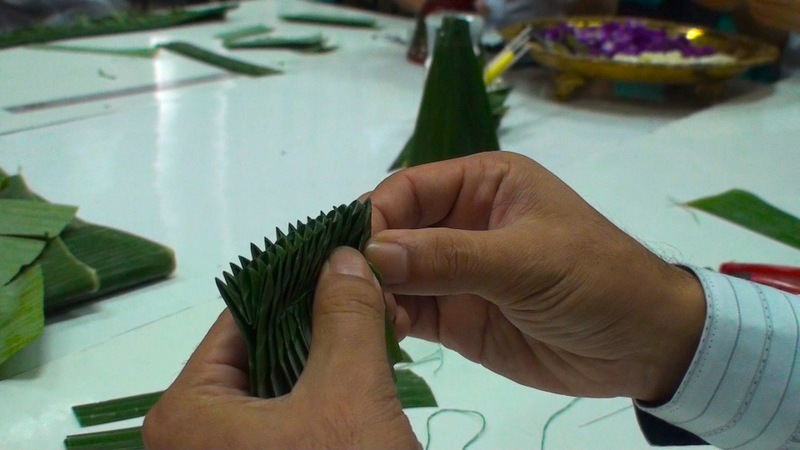 Banana leaves are carefully into make complex designs. For centuries, people have used the durable leaves of the banana plant for practical purposes, often using them to wrap food or to make basket/bowl-like containers. 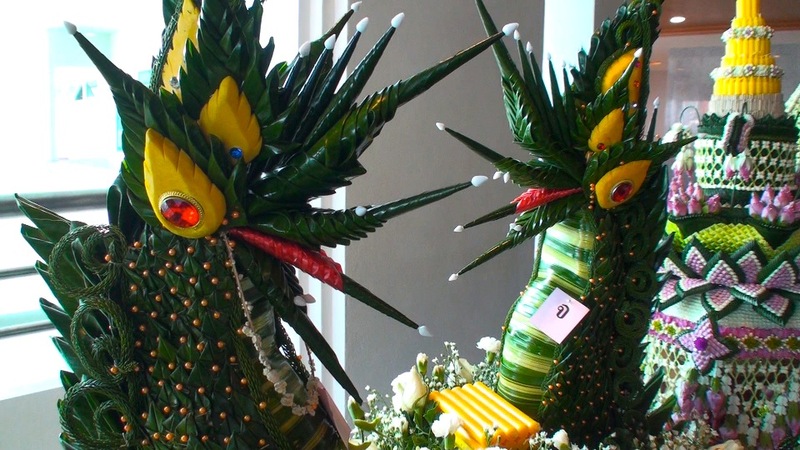 But in Thailand, people have embraced the artistic value of the banana leaf and developed a truly unique art form! Banana leaves are folded into intricate patterns and used to construct everything from elaborate floating lanterns to giant religious offerings. 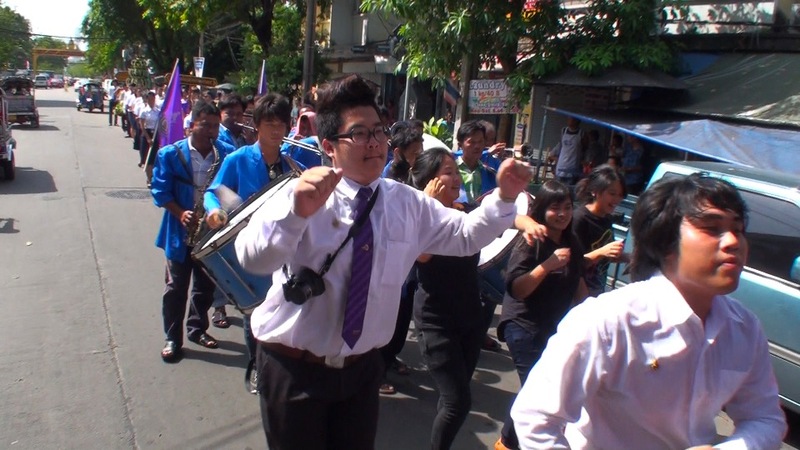 A number of universities and colleges in Thailand offer courses in banana leaf art, and the MONDO BANANA crew visited classrooms where Thai youth are learning this craft and running with it. Along the way, we interviewed college professors, authors, historians, and students who unveiled some of the secrets of this ancient and truly Thai art form. 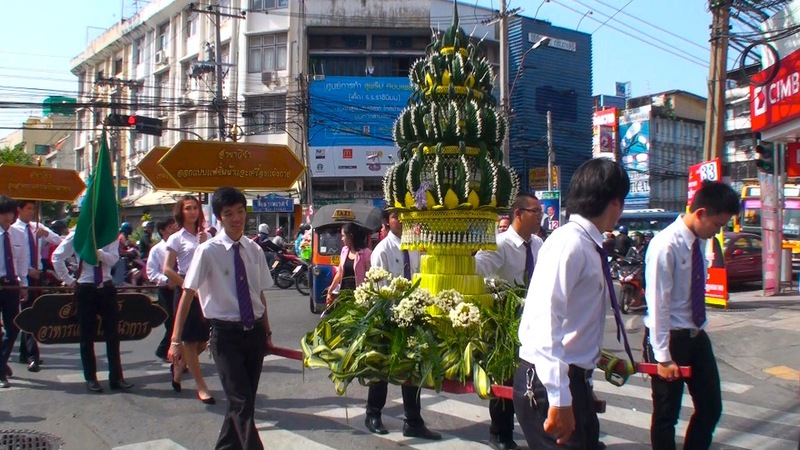 In a parade, Thai university students carry a giant "Bai Sri" (religious offering) made from banana leaves. In July, we’ll be checking out banana-foods in Thailand, where you can find bananas fried, barbequed, made into salads, steamed with rice (in a banana leaf), soaked in syrup… And we’ll visit a hip Bangkok restaurant that only serves dishes made from bananas – but that’s another update! Please don’t forget to spread the word about the Kickstarter campaign! Kickstarter functions entirely on word-of-mouth basis and it’s an all or nothing situation, so if we don’t raise all the funds by the August 10 deadline, then we won’t get ANY of the funding. Please send the Kickstarter link to friends and family, post it on Facebook and Twitter, and let people know that this banana movie needs their help! !